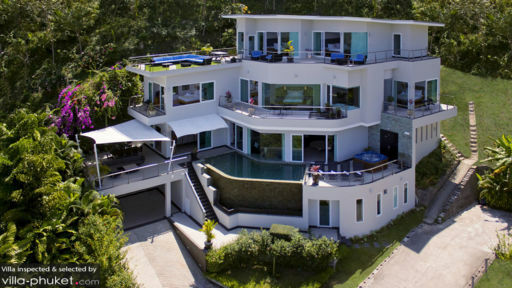 Villa Namaste is a four-level vacation residence that displays contemporary Asian architecture and design. Areas are accoutered with beautifully crafted as well as lavish appointments accompanied by first-class accommodations to assure you of absolute comfort and diversion. Built on a hillside above Bang Tao Beach, Villa Namaste, newly renovated, accords you chic vacation living amidst an air of highland exhilaration. The villa’s six air-conditioned bedrooms have new flooring, new appointments and bigger bathrooms. The master bedroom and three guest rooms are on the third level. The master bedroom has a king-sized bed, a walk-in closet and a dedicated bathroom with a rain shower and a fitted bathtub by a large window. The three guest rooms have super king-sized beds that can be converted to super twin beds as well as dedicated bathrooms with rain showers. Two more guest rooms are on the fourth level. These bedrooms have king-sized beds as well as dedicated bathrooms with rain showers. Five bedrooms open out to furnished balconies with amazing views. 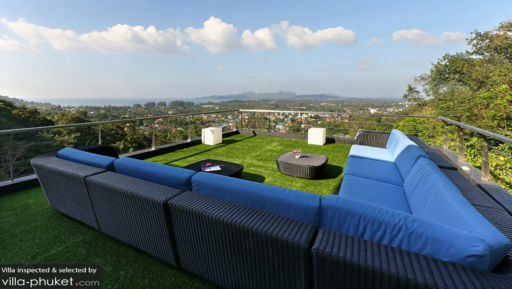 The shared balcony of the guest rooms on the fourth level extend to a grassy view deck with a long, angled couch where you can assemble for sunset cocktails, after-dinner and winding-down drinks. Aligned to the border of the now more spacious second-level exterior is the 12-meter infinity pool where you can dip into its alluring waters and dawdle on the underwater seats as you appreciate the amazing view of the Andaman Sea. On the stone deck are pool beds where you can just lay back as you bathe in the sun. On the covered terrace is a long, angled couch where you can recline as you gaze out to the distant horizon. 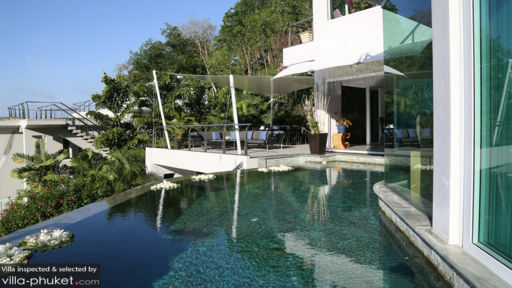 Along the edge of the infinity pool are folding glass doors that lead into the bright and spacious living area with its big and lavish couch and chairs facing a 75-inch, wall-mounted TV. At an angle is the well-equipped, gourmet kitchen and the indoor dining area which lead out to the covered terrace where the alfresco dining area is also arranged. Directed by a manager, the villa’s affable staff is mainly assigned to housekeeping. Transfers, tours, babysitting, personal catering, laundry and pampering regimens can also be arranged. Although these services will be charged to your account. A three-kilometer drive from the villa are the beaches of Surin and Bang Tao where you can go swimming, paddle boarding, kayaking, surfing as well as windsurfing. You can also go thrill seeking at the nearby Anthem Wakeboarding Park or get onboard a boat for the magical eco-tour Hong By Starlight. For some really serious retail therapy, there’s Boat Avenue and Surin Plaza. After dark, go and catch the night life of Patong Beach. Everything is great, fabulous place to stay and enjoy the holiday! Staffs are very nice and helpful I will definitely recommend it to you all. Would recommend for big parties like weddings, birthdays. But at the same time can be great family vacations. We were friends from 4 different countries between 26 and 31 yo. All been to many places in the world. But this villa made a big mark in our memories for sure!!! Highly recommend! And price is really affordable for big groups of people!